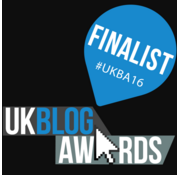 I was thrilled to be a finalist at the UK Blog Awards this year, for best individual Education blog. The awards ceremony was held on Friday 25 April, and those who follow me on twitter will no doubt have realised how excited we were to be there! The event itself was held at the very swanky Park Plaza Westminster. We decided to go all out and get room there, and ended up on the 11th floor with an amazing view across Westminster Bridge. I was joined by my OH and my PhD Buddy Rachel. Rachel had nominated me for the award so it was fantastic to share the evening with her. The event itself was probably the closest I will ever get to a film premiere (or, as I ended up saying – repeatedly – “it’s like the BAFTAS!!”). The décor, the immense rooms, the canapes, the champagne… the BFG(!). OH and Rachel even managed to get themselves in front of a camera crew whilst I nipped to the ladies. Timing – not one of my strong points. Seeing the blog up on the big screen was fab (and thank you to Rachel for whooping when our host read it out). It was a pleasure to be listed alongside so many of my favourite education blogs – and to represent higher education. Huge congratulations to Grange Park ICT who won the individual category. The only reason I got through to the final was because people voted. We had an incredible day and learned so much about the world of blogging. Thank you so much if you voted.